I was interviewed by my pals over at CBC News Vancouver on what I had to say about the traffic jam caused by The Green Men impostors this morning. It was really strange being the one interviewed and not the interviewee for a change, especially by CBC. You can watch and read the full story featuring yours truly here. On my drive to work, I was stuck is heavy traffic going through the George Massey Tunnel. I turned on the radio to hear that apparently the two Vancouver Canucks super fans were holding up traffic as drivers slowed down to see what was going on. As I passed through the tunnel, I saw who I thought were the two green spandex clad BCIT Broadcast Journalism grads I went to school with dancing and hollering with a crane holding a Canucks flag behind them. 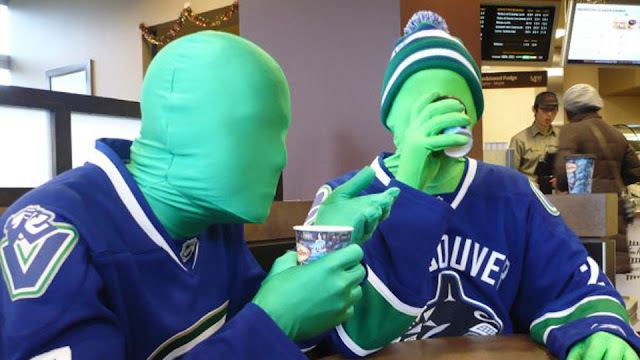 I later learned they were impostors as the (real) Green Men tweeted it wasn't them. Evidently, it was a publicity stunt. FYI, the president of 1-888-Burnt-Out Sign & Lighting Services who put on the display personally apologized for causing any traffic delay.